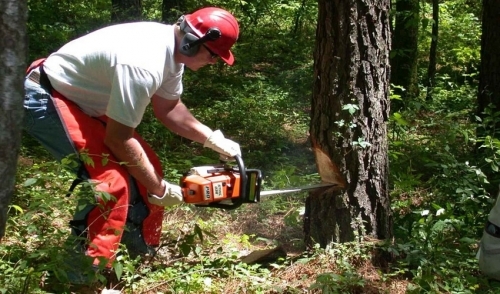 Operating a chainsaw is a good way to make the job you’re doing go more efficiently. However, like other machines, the chainsaw can be a dangerous piece of equipment. In case you own or plan to rent a chainsaw, here are some tips on operating one safely from the Occupational Safety and Health Administration (OSHA). OSHA recommends protecting pretty much everything when you use a chainsaw. This includes a hard hat, eye and ear protection, long sleeve shirt and pants, work gloves and steel-toed boots. Be sure to check that the controls, chain tension and bolts holding the handles are in proper working order. For the rest of the safety tips, check out the OSHA website.